Auckland HEMS Air Ambulance Fellows wanted! Update April 2015: Applications for this round of Fellowship positions are now closed. If you wish to make an informal enquiry about working with Auckland HEMS please use the ‘contact’ section of this website. Thank you for your interest in Auckland HEMS! Auckland City Hospital is the largest public Hospital in New Zealand and one of the best trauma centres in the country .The Emergency department is a modern purpose built, world class facility that opened in 2003. We have an enthusiastic team of clinicians who have expertise in resuscitation, ultrasound, simulation, toxicology and retrieval medicine. The closely knit team consists of FACEM’s, Medical officers and Resident Medical Officers. The department sees about 60,000 adult patients annually with a high patient acuity. 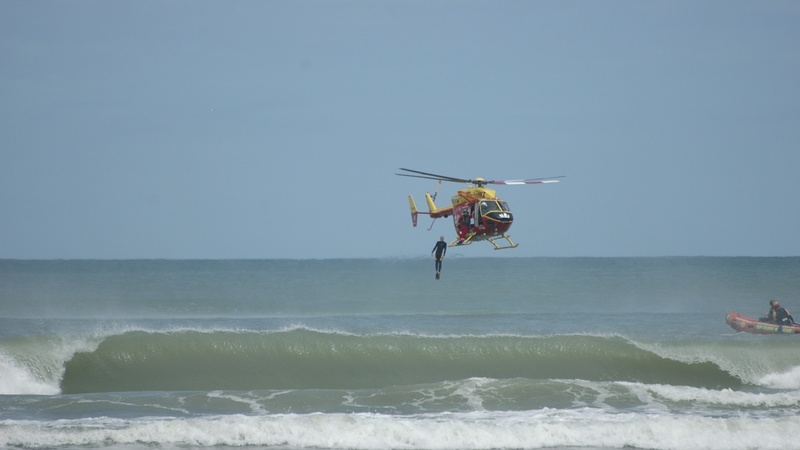 The department in conjunction with the Auckland Rescue Helicopter trust run the Helicopter Emergency Medical service (HEMS) which has been successful in providing fully integrated care for trauma patients. The department is also active in research and is currently involved in a number of key national and international projects. The Adult Emergency Department is accredited by the Australasian College for Emergency Medicine (ACEM) for Advanced Training. We run a highly successful fellowship training program and are accredited for special skills training for Air Ambulance retrieval work which is both ICU inter-hospital transfer and primary response by Helicopter. The Department is affiliated with the University of Auckland, Schools of Medicine and Health Science and is actively involved in clinical and university based teaching. The department runs several courses including the ACME course, ACLS, Ultrasound and difficult airway courses. This Fellow position is an ACEM special skills post in Air Ambulance and will involve working on the Helicopter Emergency Medical Service (HEMS) and in the National Air Ambulance ICU retrieval service. Suitably qualified candidates can discuss the position with the AED Clinical Director, Dr Anil Nair at aniln@adhb.govt.nz or Dr Chris Denny Medical Director of the HEMS service at CDenny@adhb.govt.nz. For more information please contact Ansonette Willemse, Recruitment Consultant, at Ansonett@adhb.govt.nz quoting job title and reference number 076540. Apply now at www.careers.adhb.govt.nz. Please attach a Cover Letter and your latest CV as only applications submitted online via the ADHB website will be accepted. Any emailed applications will not be acknowledged or considered. Applications close: 3 March 2015. Module three focuses on the prehospital diagnosis and management of shock and the effective use of teamwork and communication in high stress environments. We were lucky enough this month to be joined by Dr. Gareth Richards, who not only participated in the first two podcast for this module, but also provided us with an outstanding complement of critical care shock literature. The ARHT educational team would like to say a big thank you to Gareth for his help and commitment to our continued learning. We would also like to thank everyone who has helped out with this project to date. Chapter one of this module is divided into two separate lectures. The first is a focused discussion on the diagnosis and basic management of shock in the prehospital environment. The second lecture uses a case based discussion to review the principals outlined in the first lecture. Chapter two of this module is all about trauma and will focus on the pre-hospital use of whole blood as well as the pre-hospital management of both blunt and penetrating cardiac arrest…. if the words pre-hospital thoracotomy don’t get you excited then you are reading the wrong blog!!! Update: The educational team would like to extend a massive THANK YOU to Prof. Ian Civil, Dr. Mark Friedericksen, Dr. Tony Smith and our very own Dr. Chris Denny for joining us on our most recent trauma podcast. Bringing together experts from trauma services, the ICU, the emergency department and the pre-hospital setting produced (in our opinion) an outstanding discussion with multiple view points from all of those involved in the “chain of survival” following trauma. Only by working together from roadside to discharge can we improve the outcomes for our trauma patients. Module #3 – Chapter 2a – Pre-hospital whole blood. The RUSH exam: Rapid Ultrasound in SHock in the evaluation of the critically lll. Focused assessment with sonography in trauma (FAST): should its role be reconsidered? Postgrad Med J. 2010 May;86(1015):285-91. Current role of emergency ultrasound of the chest. Crit Care Med. 2011 Apr;39(4):839-45. Ann Intensive Care. 2014 Jan 9;4(1):1. Management of bleeding and coagulopathy following major trauma: an updated European guideline. Crit Care. 2013 Apr 19;17(2):R76. N Engl J Med. 2014 Feb 27;370(9):847-59. N Engl J Med. 2013 Oct 31;369(18):1726-34. N Engl J Med. 2013 Sep 26;369(13):1243-51. N Engl J Med. 2013 Aug 29;369(9):840-51. N Engl J Med. 2014 May 1;370(18):1683-93. 1.1 Define the term shock. 1.2 Describe the cellular pathophysiology of shock. 1.3 Describe the classification of shock. 1.4 Describe the pathophysiology for each classification of shock. 1.5 List a differential diagnosis for each category of shock. 1.6 Outline a diagnostic approach to shock. 1.6 Outline the pre-hospital management priorities for each classification of shock. 1.1 List and describe the pathophysiology of the causes of traumatic shock. 1.2 Describe the pathophysiology of coagulopathy of trauma. 1.3 Outline a diagnostic approach to traumatic shock. 1.4 Outline the pre-hospital management priorities when treating traumatic shock. 1.5 List the ARHT trigger criteria for the administration of pre-hospital whole blood. 1.6 Outline a management algorithm for the treatment of a blunt traumatic cardiac arrest. 1.7 Outline a management algorithm for the treatment of a penetrating traumatic cardiac arrest. 1.8 List the indications for pre-hospital tube thoracostomy. 1.9 List the indications for pre-hospital thoracotomy.